no mas pantalones: Brad McGinty "Kaiju Santa"
Forget the crotchety old Krampus - if Brad McGinty's "Kaiju Santa" doesn't keep the kids in line up until Christmas, the naughty list is the least of parents' worries. No wonder kids are brought to tears when they come face to face with the fat man. 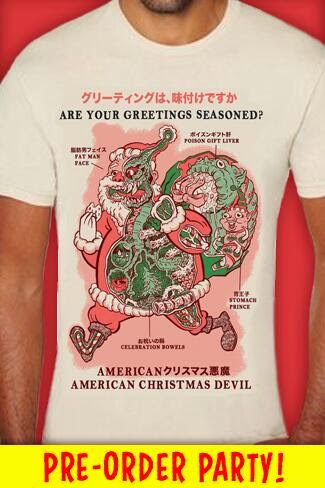 Exposing the true horror of the "American Christmas Devil," this festive t shirt is available for pre-order through Friday, 11.08.13. A few overprints may end up in the GLORP Gum! company store, but you don't want to end up in a Demontor costume wrestling with Arnold Schwarzenegger for a "Turbo-Man" action figure.